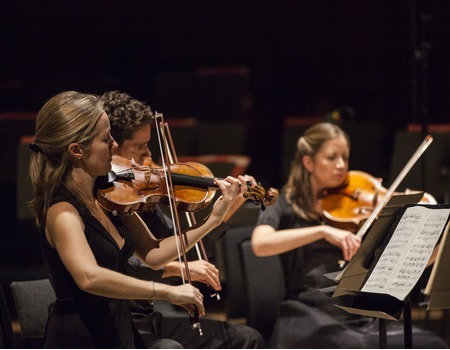 Join the musicians from the Philharmonia Orchestra's Fellowship scheme in an evening of chamber music inspired by the Zédel cocktail menu. Exploring some of the geographical and gastronomic inspirations of our musicians' favourite mixed drinks, the programme will include a cornucopia of musical delights. Listen out for 'Old Fashioned' classics such as Corelli and Bach, enjoy a 'French Apertif' by Parisian composer Jacques Ibert and take a tour of 'Manhattan' with music by Gershwin. The Philharmonia's Emerging Artists programme supports young composers and instrumentalists at the start of their careers, providing opportunities to nurture, showcase and stretch the next generation of artistic talent. Alongside an intensive training in orchestral playing, the instrumental Fellows are given time and opportunities to hone their musicianship and represent the orchestra in events ranging from performances in schools to royal events. Our current Fellows have been with us since September and are all recent graduates from leading music conservatoires: Alix Lagasse, violin (Royal College); Emma Oldfield, violin (Royal College); Henrietta Hill, viola (Guildhall); Yaroslava Trofmychuk (Royal College); and Emre Ersahin (Guildhall).